In ORTHODOXIA 1999-2000 two maps are wrong. I corrected the maps of Antiocheia and of Jerusalem with the help of father Irenaios Delidimos, teacher of Church history at the University of Thessaloniki. one Bostra of the patriarchate of Antiochia, Busra ash Sham, the Byzantines called it "Bostra tes Ausitidos" "Βοστρα της Αυσιτιδος" or "of Damaskus". South boundary of the metropolis is the river Mujib. one Bostra of the patriarchate of Jerusalem, Boseira of the land of Edom, "Βοστρα της γης Εδωμ." The boundaries of the metropolis (according to the Taktikon of Jerusalem of the year ca. 1000) the river Hosár (Wadi al Hasa) to the River of the Waters (Wadi Mayein) and the wells (Wadi el Ain). soon north of Busra ash Sham in Hawran is Es Sueida, where today's metropolitan of Basra Bostra lives (ORTHODOXIA 1999-2000 page 41), Basilios Samaha. The Byzantines called it "land of Hiob" according to Septuaginta, Hiob 1,1. The historian Eusebios writes in the 4th century that the Jews show the remainders of the house of Hiob in the village Karnaim (today Sheik Saad, the happy leader), "where Hiob lived with all his wealth"; not far from there is the village Sheik Miskin (the leprous leader), where Hiob lived when he fell ill with leprosy. This is the Islamic tradition there. This "Bostra tes Ausitidos" or "of Damaskus" was metropolis already at the time of the first Ecumenical Council 325, and had 17 bishoprics, one of them was Gerasa, another one Philadelphia (Amman) which are now with Jerusalem. South boundary is the Wadi Mujib "Μουζιπ" going into the Dead Sea. The village Boseira is mentioned in Isaias 34,6; 63,1; Ieremias 49,13. Boseira does not appear in the lists of towns of the 6th century (Hierokles, Georgios Kyprios). The gap might be due to the distruction mentioned by the prophets or to a change of name. Since the Arabic invasion this Bostra again is mentioned as metropolis, at least since the year 800. 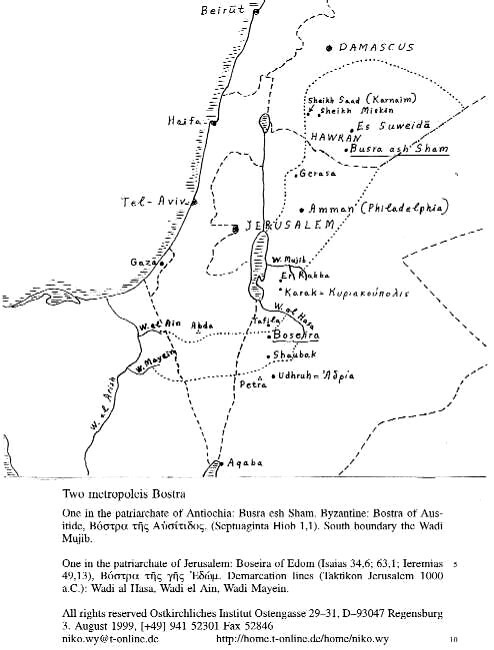 The Jerusalem Taktikon (Notitia) of the year 1000 (edited by Gregorios hierodiakonos Palama, Jerusalem 1862, pages "τος-τπβ)" describes the boundaries of this metropolis Bostra: the river Hosár (Wadi al Hasa) to the River of the Waters (Wadi Mayein) and the wells (Wadi el Ain). The south boundary is the demarcation line with the archiepiskope Adrias (Udhruh), the North with Abidan (Abda) which belongs to the archiepiskope Gaza. The Jerusalem metropolis Bostra had been dissolved by the Osman authorities and had fallen into oblivion both in the patriarchate of Jerusalem and in the patriarchate of Antiochia. E.g. : in the year 1700 patriarch Chrysanthos of Jerusalem wrongly thinks that the metropolis of Bostra near Damaskus is the old Bostra of Edom, and wrongly writes in his Syntagmation that the patriarchate of Antiochia took it over against the ecclesiastical law.